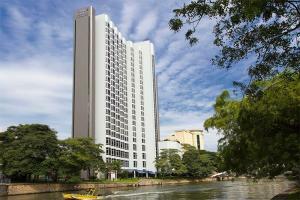 Escape to popular entertainment districts and cultural experiences at Four Points by Sheraton Singapore, Riverview. With a privileged location at the Singapore River in Robertson Quay, explore nearby Tiong Bahru, Clarke Quay, Boat Quay, Marina Bay and more. Admire the panoramic, iconic views from your window seat in contemporary accommodations with 24-hour room service. Also on the property, enjoy a Tall Tale Pale Ale crafted brew not available anywhere else in the world, a refreshing dip in the pool, an energizing workout at the 24-hour gym, and your choice of global cuisine at gourmet restaurants. With 14,600-plus square feet of flexible event space and dedicated planners special occasions are managed with ease. Nearby major conference venues such as the Sands Expo & Convention Center make it convenient to balance work and play for business travelers.